Tonight on NBC their drama Chicago PD returns with and all new Wednesday, September 28, 2016, season 4 episode 2 and we have your Chicago PD recap below. On tonight’s Chicago PD recap Cdr. Fogel (Ian Bedford) takes Platt (Amy Morton) to task for going over his head to have Tay ( Li Jun Li) assigned to District 21. Did you watch last week’s Chicago PD season 4 where the team investigated a murder in which the victim appeared to have been wearing a CPD-issued wire? If you missed it we have a full and detailed Chicago PD recap from last week, right here! 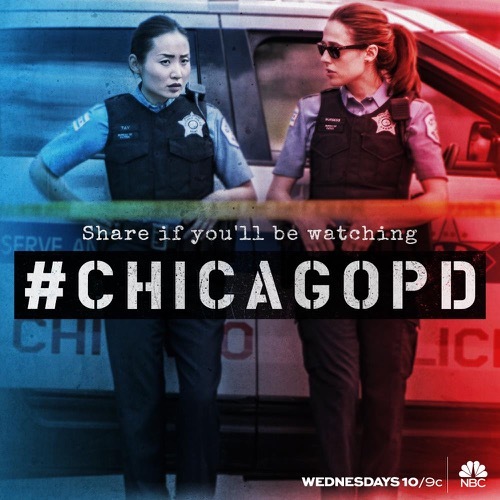 Chicago PD’s episode named “Made a Wrong Turn”, begins with newly paired Officer Kim Burgess (Marina Squerciati) and Officer Julie Tay (Li Jun Li) out on the streets. Of course the ride starts out well, until they get a call of an “auto being stripped” and they take the call. Chicago PD’s Burgess and Tay chase the man who was inside the vehicle, but end up losing him down an alley. Detectives Kevin Atwater (LaRoyce Hawkins) and Jay Halstead (Jesse Lee Soffer) arrive on the scene and offer to help. Burgess produces an ID the guy dropped, and it belongs to a woman who lives in North Brook; when Tay calls in the plates, the car is registered to a Sara Murphy and Halstead finds fresh blood in the car. Just as Chicago PD’s Dt. Halstead discovers the blood, a woman comes out of her house screaming for help because there is a white boy who looks almost dead on her back porch. The man’s wallet says he lives at the same address on the woman who owns the care. They rush him to Chicago Med. They believe they have a carjacking that went bad and now have a missing girl. Back at Chicago PD District 21, Sgt. Voight (Jason Beghe) and Dt. Erin Lindsay (Sophia Bush) small talk, but beat around the real issue. Dt. Adam Ruzek (Patrick John Flueger) bring everyone up to speed on the case that fell into their laps after discovering Nathan Ward’s badly beaten body near his fiancé, Sara Murphy’s car. Neither one of them have any type of record, but CPD have put out a Missing Person’s report to find Sara. Just as Chicago PD’s Intelligence Unit is discussing the case, Commander Crowley interrupts them, saying there have been 60 shootings this week, 12 of them fatal. She says she isn’t going to be politically correct, what they have is a WHITE woman missing in the heart of a BLACK ghetto. She wants them to assume the worst, and that Sara has been abducted, so she tells the team to do whatever they need to do to find her, but do it carefully! Commander Crowley pulls Sgt. Voight aside and tells him she means it when she says be careful, because there is a lot of eyes on the police right now. Voight tells her that to him it doesn’t matter, if it was a black girl missing on the North side, he would go about it the same way he is now. Chicago PD detectives Halstead and Lindsay are riding together and Lindsay tells him she doesn’t want to move in with him, she wants him to live with her. They meet with Sara’s parents at the hospital who inform the detectives that they had dinner with their daughter and Nathan, and separated around midnight. Dr. Choi comes out and informs them that CT scans say Nathan has some brain swelling and bruising, but it looks like he didn’t suffer any serious brain damage. Dt. Lindsay asks if there is any reason Sara or Nathan would go into South Austin? Sara’s father gets angry and says they should be looking for his daughter instead of questioning them. She reassures them that there are 100 cops looking for her right now. Sara’s mother just pleas for them to bring her daughter home. Voight is out on the streets organizing the search, informing the officers that Sara has been missing for over 12 hours and they need to search everything and everywhere. Dt. Atwater joins a few of the locals at the park, offers them some money and says he would do the same if it was one of their kids. They take the money and inform Atwater that if the car was picked clean, they need to go to Lou’s Liquor because everything goes through Lou. Atwater and Ruzek go into the store and grab the two guys that were trying to take off, one of them is only 15-yrs-old; who is in possession of a brand new expensive cell phone, the kid admits he found it in that car. He has no idea where Sara is, but he saw Nathan speaking to a guy named Hudson, who has a record a mile long. Voight is no longer playing games, when they find Hudson, they learn that Nathan was in their area to buy some “H”. Hudson says that Nathan was the one screwing around. He was giving Hudson fake money, and he had to pay, but he swears Sara was never with him. When Nathan is confronted he swears he left Sara in the car. While Chicago PD officers are looking everywhere, Voight and Olinsky come upon Bobby Trent, who is not only wearing a bulletproof vest, he also has a sticker on the back window of his vehicle that resembles all police vehicles. Voight orders him to leave the scene. Meanwhile, back at District 21, Sgt.Trudy Platt (Amy Morton) meets with the Commander who forced Officer Tay into the lowest position possible for an officer, and he orders Platt to put Tay back at that job or she will regret it. He screams and orders her in front of all the officers in the station. Chicago PD’s Craig Gurwitch (Samuel Hunt) is having a difficult time with mobile for Voight and is considering going back to the Rangers in Afghanistan, where they need a com specialist. Halstead is shocked to hear it, but Gurwitch says what are his options, to join the Police Academy and be a rookie at 31? Halstead asks Gurwitch if he remembers what it did to him last time, how he couldn’t sleep and ended up with an addiction to pills. Halstead says before he makes a decision, they need to talk about it. Just as Voight is getting a thank you from one of the residents for putting his grandson in prison, Gurwitch arrives to tell him that Sara wore a watch that he could track and he tracks her to a hotspot for drug addicts and the homeless. Unfortunately, they find the watch and a patch of her hair, but she is nowhere. After a witness tells them, he saw a black male over 6 foot 4 drag her into a van and assaults her for over 30 minutes. After someone smashes the windshield of Burgess and Tay’s police vehicle, they get information from someone in the neighborhood who is willing to help the police. They quickly learn that Bobby Trent, has been in the area, recording all kinds of things, including that night. Trent, who has been acting like he is an undercover officer, recorded the entire thing and Sgt. Voight and Dt. Olinsky (Elias Koteas) retrieve the evidence, after which Voight roughs him up a little bit. Olinsky tells him if he doesn’t stop recording the violence or be at any more crime scenes, Trent will feel first hand that kind of violence. Chicago PD Intelligence Unit find out who they are looking for, they find his van is inside a secure community named “The Gardens”. The Gardens is completely protected, no access, but Voight says they’re going through the front. Voight tells the crew about “66”, and they said they’d will deal with it, Voight tells them it’s too late, and if they don’t help, he will call SWAT. They agree, even the crew say he is a sick dog that needs to be put down, and reveal exactly where he is. Halstead shoots “66” through the wall. Sara is saved. Chicago PD’s Gurwitch meets with Sgt. Voight and informs him that he plans on leaving and go back to Afghanistan to serve his country. He asks Voight to lie for him to clear his criminal record so he can go back. The scene ends before we know. Do you think that Voight will lie for Gurwitch, or will Halstead convince Voight to not help Gurwitch go back to Afghanistan? To end tonight’s episode, Erin and Jay are celebrating living together, although disagreeing on where things should go. Be sure to tune into NBC’s Chicago PD to catch up on all these stories and more. Check CDL often for updates, news, rumors and spoilers!